Are you interested in a steampunk, gender-bent Sherlock Holms from the author of Hunger Makes the Wolf? Then this is the book for you! All I knew going in was that this was by Alex Acks and that it was short stories. I’ve liked enough of their work to request the ARC based on their name alone. 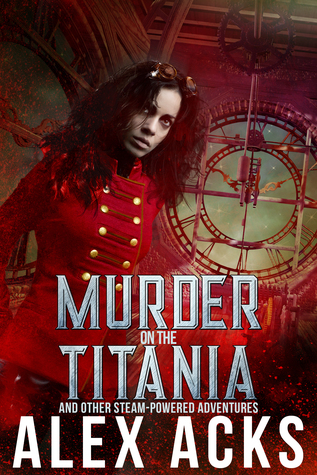 As it turns out, the stories in Murder on the Titania and Other Steam-Powered Adventures are all related, mysteries with the same character at their center: Captain Marta Ramos, the most feared pirate in the Duchy of Denver. A lot of steampunk has this problem where it values aesthetic over story and characters. Thankfully, none of these stories fall into that trap. The focus is squarely on the characters and the mysteries their unraveling. Acks never lets narrative get distracted by dwelling on world building, even though there’s plenty of fascinating world building to be had. For one, there’s zombies! But they actually play an incredibly minor role. Mostly it just means that murderers have to be careful to take out the brain, or else their victims will rise from the dead and begin slaughtering everything in sight. You never actually see a full on zombie, or at least not anything more than a corpse’s fingers starting to twitch before its disposed of. This collection contains four novellas and one short story. The first story is the novella Murder on the Titania, which is the only story not squarely centered around Captain Ramos. Instead, it focuses on Colonel Geoffrey Douglas, the Duke of Denver’s new head of security, as he takes a flight on the luxurious airship Titania, escorting some valuable jewelry back to Denver. He’s heard rumors of the famous pirate Captain Ramos being active in the area, so he’s on full alert, when suddenly there’s a dead body! There’s less than forty-eight hours before the ship dock in Denver for Colonel Geoffrey to find the truth. The Curious Case of Clementine Nimowitz (and Her Exceedingly Tiny Dog) gives a closer look at Captain Ramos, her crew, and how they operate. It follows Captain Ramos and her right hand man, Simms, as they break in to rob a house and find an dead body, along with two different wills naming two different heirs. Is it a suicide or a murder? “The Jade Tiger” is the shortest piece in the collection. I don’t want to say too much on it, but a woman asks Captain Ramos to perform a robbery for her. The Captain suspects it’s a trap, but she can never resist a good mystery. It’s the only story in the collection that doesn’t involve a murder mystery. It also has some interesting hints at Captain Ramos’s backstory. I want more! In The Ugly Tin Orrery, Captain Ramos has an interesting encounter during a train robbery with a man trying to defend his luggage. She takes it anyway, but a few days later, the man turns up dead. Obviously, she has to investigate! The final novella in the collection, The Flying Turk, returns to the setting of the Titania, as it’s set to go off on its first clockwork-steered flight. Do they really have a working difference engine, or is it the claims of a fraud? Captain Ramos loves engineering, so she drags Simms along with her to investigate. I really enjoyed that these stories all used the same world and characters. The linked format lets me get to know the characters and grow attached to them, which is something I can have trouble doing with shorter pieces. All in all, this collection was a ton of fun, and I would be happy to read more mysteries following Captain Ramos!